Cake Wrecks: "World" Tour, Take #2! Click here for details and to RSVP for Austin. Or keep an eye on the right hand sidebar; I'll be updating the links and dates for Kansas City, New York, and Bethesda as I have them. So glad to hear that you and John are healthy! We eagerly await your arrival in NYC! WV: synxe. The rest of the tour in in synxe. Glad to hear John is feeling better! LOVE the new logo!! Very happy to hear that John is on the mend and you are doing well!! Glad to hear you guys are feeling better!! What are the two sexiest animals in the barnyard? A brown chicken and a brown cow! I'm so glad you and John are surviving! Even though I live in Seattle, I wish I could come and give you both all my love in Dallas. The tour logo is epic! Well done, and I'm so glad to hear you're back. You know, LA has some really interesting strains of bacteria, in case you're interested. And, you know, um, we share. So, what's one more stop, right? Glad you're back on tour--even if you're not coming to San Diego. I also love the new tour logo. Wow, you guys are resilient! Glad to hear John is feeling better and you're getting back to the tour. (Love the wounded carrot jockey.) Although I am a bit disgruntled that you're not coming to Ohio. WV: Borkers - What you have to be to go on a book tour while recovering from a wild strain of bacterial infection and a nasty head bonk. I'm glad you guys are back on track,and nobody lost limb, life, or broke any fingernails and I'm gonna pretend that my two humourless ( despite being heartfelt- but what does that count for these days?) posts helped and feel all warm and fuzzy inside. Beyond that, I'm sad you guys rescheduled Austin when you did. I'll be 6 Hours away in a very small, non-cakewrecked town. Granted, the weekend after that i have to hope and pray that as the curtain goes up on our play the set doesn't kill anyone, so i guess fate was against me getting to have a cakewrecks day. I was really looking forward to it, so i guess this means you guys have to write another book and come back to Austin. Love, The Girl Who Writes Too Much. So glad y'all are better. Are y'all sure y'all are better enough? Don't want any relapsing. I hope you take along a personal physician to keep you going through the shows! Just not that guy that Michael Jackson had. WVW: expre. That which used to come before. Please please please PLEASE come to Hollyweird. P.S. I'm gonna be sending you something quite soon. Hope you love it. WV: unapl. You're like the anti-christ of Apple...The UnApl! I am so very glad that you guys are doing better. I guess my positive vibes through cake wreck book reading at the office worked! 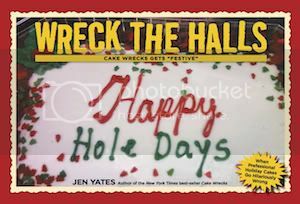 Yes you read that correctly, I read cake wrecks to my coworkers every day! They tease me when I say "do you want that on a cake? I am sure I can find one on cake wrecks!!" When are you coing to Hawaii?? We have bookstores here too you know! I'm very glad that John is getting better quickly! I'm also glad- though not quite as much- that you'll be rescheduling your Bethesda stop. And the new logo is awesome. The main reason for me commenting is to strongly urge you to sell that on tshirts. You people are as relentless as a CCC maker with an airbrush. Okay - you have to make the new logo available on zazzle!! Be sure you guys are taking it easy and taking care of yourselves! Any chance of making it to Phoenix? I didn't see it mentioned on the original list of stops. New logo! Especially cute little hospital bracelet! All the best for the rest of the tour - protective prayers ordered, guardian angels ready for deployment, universe told to watch out! Glad everyone is feeling better. Take care and don't push it too hard, 'kay? WV: distersp What a urine sample is from a dizzy blonde. "That distersp sure was cloudy!" Glad to hear that everyone's on the mend! Congratulations on the success of the book! This is very exciting. I am so glad that John is okay--he's been on my mind. Actually, mostly his infections have been on my mind--I work in infectious diseases. So glad to hear you're all well again, and that things are back on track - all the best and GOOD LUCK! oh my gosh. that graphic is hilarious. glad to hear john is recovering and thankful for your resilient spirits! Glad to hear that John is making a speedy recovery and can add his commentary on your book tour stops. I hope there's a baker there who can make a 'Get Weel Soon' cake for the rest of your book tour locations! All the best from your fans from Australia. Wish you were coming to visit us! It's awesome to see you all healthy again, back up and on the roll again! how adorable is that wounded carrot jockey baby!!! too cute and perfect. i admire y'all's tenacity at getting back on the trail, however i worry (it's the nurse and mom in me) that you're pushing yourselves too quickly. sadly, i won't be able to make it this saturday (am frickin' bummed) due to previous travel plans. I'm hoping I can come see you this Saturday in Austin! Your new graphic is hilarious! I'm so glad you guys are doing better. Hope you can make it to Bethesda before I move. I'm so glad everyone is doing better! I've been praying so much for you guys! I'm glad you're going to do the rest of the tour! Be careful not to go back to it too fast, everyone will understand!! Love the new graphic. I'm so glad to hear that John is doing so well! Heck yeah, can't wait for NYC! The new tour logo made me giggle! You have an amazing sense of humor! That is freaking AWESOME! You guys are so cool! Although we already got to see you in Chicago, we're exited that you're continuing your tour and others get the chance to meet you. You guys are amazing people. I hope you both continue to feel better. I love the new world tour logo! Very clever!! Awesome!! Glad John is on the mend! Glad everybody is feeling better! Love the new tour logo!! Is that a hospital band on his right wrist?? So glad that John's out of the hospital! Have fun on the rest of the tour! Wow, I can't believe you guys are back on tour so soon; way to go! I'm really glad that John is doing better - I'm sure everyone is going to be so happy that the tour is continuing! lol! The new tour logo is awesome! First time posting but just wanted to say so glad you guys are feeling better and able to carry on with the tour. Based in the UK, I'm relying on your reports and pics. You never fail to cheer me up with your sarky comments and pics. The artwork was just the smile I needed this morning. Glad John is feeling better. I agree with Karen - the new logo rocks. You two have the best sense of humor. I'm glad John is better. Now I have to see you when you come to nyc! Thinking about driving the over 3 hours to Bethesda just to support you guys! Way to go on getting it moving again! Oy, y'all are dedicated! I hope you get to enjoy the rest of the tour! That new pic of the carrot jockey is HYSTERICAL!!!!! Hope you both are feeling better! WE LOVE YOU GUYS!!! Happy Dance! Happy Dance! Happy Dance!! Thank goodness that John's okay, and making a remarkably fast recovery from those infections! I would never have expected the tour to start again so soon. That is the cutest little carrot jockey trooper EVER! :) So glad yall are able to get back on the road. After all, The show must go on! And you have definitely lived up to that! Love yall! WV: punce: what jen will do to someone if something else bad happens! Hmm, Austin is pretty close. If I come, will I come home with pneumonia? The new logo made me laugh out loud for real! That's the spirit! Don't overdo it now, make sure you two get plenty of rest! WV: cherier- I am much cherier to hear y'all are feeling better. OMG, I LOVE your updated carrot jockey logo! That is freaking hysterical - and oh so appropriate! Are you trying to kill John?? Poor baby...love the Bruised Baby logo, though! I tell ya, this little cake blog sure hasn gotten exciting lately. Still, I wish John a complete recovery (and Jen continued good health!). Your graphic truly cracked me up. Does Ray get credit for this masterpiece? Can't wait to see you in Maryland! We'll be there with our cupcake wrecks and everything! Take care now. That logo made my morning. WV: resses. The World Tour is no longer in resses. Be careful and don't overdo, k? You'll give all of us wreckies a complex. Woot! Even though you're not coming anywhere near me, I'm so happy for both of you that you're able to resume the trip. Love the logo! I soooooo wish you would come to Nashville. But in the meantime I'll content myself with keeping up with your adventures on the blog. Continued get well wishes sent your way! That new logo is the greatest thing ever. OH EM GEE!!!! LOVE the new logo!!!! so funny. brilliant. That beat up baby jocky is too cute! Huzzah! Best of luck to you as you wrap up the Tour! Somebody PLEASE make the awesome new logo into a cake - quick! So glad you two are able to laugh about this and move on. Congratulations on good health! Cake Wrecks 2: Electric Boogaloo. Let it be known that a silly thing like a little potential death can't stop John and Jen! I'm so glad to hear that John is feeling better, and that you are going to carry on with the tour! I hope I can make the new KC date! wf- phipti "My favorite rapper is 'Phipti Cent'"
Yay on John being better! My daughter says the first one is the sun setting in the horizon and glowing over the ocean, with sand in the foreground. I guess the squeezy cheez things up top could be clouds. No clue about the Life Savers! The third one....beach umbrella? No clue on the others. The new World Tour (or "World Tour") logo is the best logo evah! Evah! I wish I could go to Austin Saturday, but I'm scheduled to work all day. good grief do you never rest!!! LOVE the new world tour logo. So perfect. I'm so glad to hear you are both feeling better and are up to a tour stop. Wow, you guys are troopers! I'll keep you in my prayers that no more "unexpected" things happen. I LOVE the new logo! Can we copy it for our books? purty please? Glad you're feeling up to it. I love your site!! I discovered your it the day before you were scheduled to be in Bethesda, and was upset because I wouldn't be able to attend.. I am so happy that you and John are doing ok, but I am also excited that this tour date got pushed back! I would love to be able to see you guys when you finally come. Best of luck! Jen, you are insane. And amazing. Please let us know what we can do to help you out, if there's any kind of fundraiser for John's medical bills or anything. Really glad to hear that John is feeling much better! Sad because I will be out of town this weekend and will miss your Austin appearance. :( At least I get to vicariously participate through the blog! You need to make shirts out of that new logo. AWESOME. I wish you could come to New Haven, CT, at the Yale Bookstore or something, where we would love to be visited by you (for your next world tour, I mean). So glad you are both feeling better! Can't wait to see you in Kansas City! Ditto all of the good thoughts! oh! this means that john is feeling all better and ready to go again! YAY! so glad you're all healthy again. And I LOVE LOVE LOVE the logo! Glad to hear you are back on the road, and LOVE the new tour logo. Cake Wrecks "World" Tour 2: The Wreckoning. Coming to a bookstore near you this Fall. Jen and John- I am en-ex ICU nurse and I just had to write and throw my 2 cents in- PLEASE, PLEASE, PLEASE be very cautious and careful in your travel plans!! Septicemia is no joke, and you are very lucky to have escaped it as well as you did. John will be weak for some time yet, and needs to take frequent rest brakes. Much less it being flu season- not a good time to be traveling all around, exposing ones self to all those nasty bugs while still recovering from such a nasty illness. P.S. You guys are hysterical, and I love the site! New logo for the (epic) WIN! Woo hoo! You guys ROCK. John your dedication is amazing!!! Is there anyway you could add a stop in Santa Barbara, CA? I know alone in my work there are over a dozen wreckie fans. Good Luck on the tour and this time lets make sure the only pain involved stems from laughing so hard your stomach hurts. It's really great to hear that John is doing better, and congrats on being able to continue the tour (and thanks for still wanting to!). I'm looking forward to seeing the rescheduled KC date. I couldn't have gone on Monday, but maybe I'll get to see you after all! Cake Wrecks- How I love you! That is the most tragically adorable logo I have ever seen in my life. I love this logo! Hilarious! Feel free to add a stop in the Detroit area while you're at it!! Ok, the new logo is AWESOME. Just... AWESOME. Love it! Wish I could make it to Austin, but it's just a wee bit out of my driving range. Too bad it's not San Antonio. Maybe next time; a girl can hope! Hold on there, buckeroos. What doctor thought that continuing the "World Tour" constituted rest and relaxation? Are you out of your rabbit-assed minds? And both of you better be wearing surgical masks! Especially John whose immune system must be nonexistent. And make him wear a motorcycle helmet too. Are elbow and knee pads necessary as well? OMG That carrot jockey logo is hysterical! I'm glad to hear John's doing better, and you're rescheduling... but wouldn't it be a BETTER world tour if you came to Las Vegas? Puhleease? So glad you guys are better! Austin eagerly awaits you Jen and John! Good luck on the rest of your tour and may the rest of your trip be incident free! WV: cologite. Also co-logite. Fellow follower of a blog or "web log." The co-logites back east will be happy to see you on the rest of the tour! On an 11-year-old's science exam: "Three kinds of blood vessels are arteries, vanes, and caterpillars." Glad to hear John's vanes and caterpillars are infection free now. So glad that John is feeling better and the dates are being rescheduled! Wonderful news - hope the rest of the tour goes well? When are you coming to Europe? I'm sure we can offer more exotic diseases... I mean wrecks. Love the new logo! Great that you're all healed up and going again! Better luck this time, from snowy (yes, snowy!!!) Alberta, Canada! You're awesome! Can't wait til you get to D.C.! Love the changes to the logo! Glad to hear John is well enough to restart the tour. Hopefully I'll see you at the rescheduled KC stop. Wish you could extend your "world" tour to Canada? I would be first in line! I was lucky enough to see you two in Portland before all the illness, and I can assure your fans it is worth the wait! Wishing you an uneventful rest of the tour---you deserve it! So glad to hear you are both feeling better. I send you best wishes for the tour redux. Please don't try to do too much too soon. I speak with heartfelt concern and experience as someone who regretfully ignored following the doc's cautionary words after a bout with pneumonia.... I thought I was invincible but time and those lingering infectious bugs proved otherwise and led to a major relapse. WV: wousines Please take a well deserved rest if you are experiencing any wousines. So glad John is feeling better and the tour is back on - not that you're coming anywhere near the god-forsaken hellhole where I reside. Not that I blame you either. The new logo is just begging to be slapped on t-shirts and tote bags! I want it! Two blondes walk into a building. You'd think one of them would've seen it. Oh my god, LOVE the new tour logo. Love the new logo and the slogan! I don't usually comment on here, but when I heard that you were both sick, John especially, I felt I should. Super glad to hear that you're both feeling better and ready to take on the world again. I wish you a speedy recovery! LoVe the new tour logo... it's aggressively adorable! My prayers are still with you for a safe, healthy, successful, fun book tour and return home. Glad you are both healing. Please tell me you will make this new logo into a t-shirt. I want one! It's bigger! It's badder! It has a twitching brow! It's the Wreckmeisters! Beating, folding, and whipping won't keep 'em down. Your blog is one of my favorites!!! I love the revised logo! Thank you for thinking of us and continuing the tour, but don't forget to think of yourselves. We don't want you to burn out just yet, I'd have nothing to do at work! wv- eatscias. Watch out for the CCC, they may eatscias. You two are awesome. So glad you're back in the saddle. Or riding the carrot. Or something. Unless you are coming to southern Ohio, I won't be able to attend the tour - but I LOVE the logo! Glad that everyone is feeling better. Glad John is feeling better and you're back on the road. Looking forward to your arrival in Bethesda! We're bringing my 2-month-old granddaughter to meet you--no mohawk, no carrot. But love the tour logo! Loving the new logo! Battered and worn you may be, but soldier on you will. Congrats on rebounding so quickly! Oh man, that logo kills me! Glad John is doing well! yeah!!!!! i can't wait to see you in bethesda. so glad to hear that you both are on the mend. prayer works! love your "new" logo, and your great sense of humor. The updated logo is AWESOME!!! That logo is badass. Glad to hear you're all better and able to reschedule! Totally love the new logo, btw. I think that you're moving too fast here...don't you need time to properly recover? And if you go anywhere at all, it should be Hawaii, for proper R&R. I hope the KC stop is resceduled soon!! OMG...I need that new logo on a t shirt....good luck with the tour part deux, take it easy! WV: lastall: the stall that I use in public restrooms. the last one. Of course, adding Charlotte, NC to boot! Right? Right? wv = comitivi ... ? I LOVE the new logo and I'm so glad you'll still be coming to Bethesda! Yay for MD! Love the new logo, and so glad to hear John is healthy again! Can't wait to hear the details on the NYC reschedule. I await the Kansas City date with baited breath! I absolutely love this site!! what a tickler!! Please, please, please in the name of all buttercream glory, tell me you are going to make shirts with the World Tour logo. Did i say please? Anyway, shirts would be very cool. Under neat dat. Thanks in advance, AF.